The fungus Pleurotus ostreatus was investigated to assess its ability to remove diclofenac, ketoprofen, and atenolol in hospital wastewater. The degradation test was carried out in a fluidized bed bioreactor testing both the batch and the continuous mode. In batch mode, diclofenac disappeared in less than 24 h, ketoprofen was degraded up to almost 50% in 5 days while atenolol was not removed. In continuous mode, diclofenac and ketoprofen removals were about 100% and 70% respectively; atenolol degradation was negligible during the first 20 days but it increased up to 60% after a peak of laccase production and notable biomass growth. In order to identify the enzymatic system involved, further experiments were carried out in flasks. 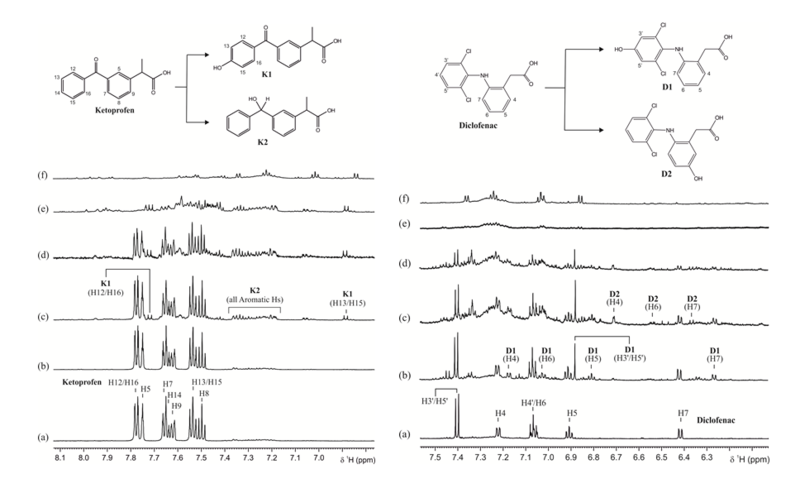 Two intermediates of diclofenac and ketoprofen were detected by nuclear magnetic resonance (NMR) spectroscopy. Moreover P. ostreatus was able to reduce chemical oxygen demand of the hospital wastewater which is an important advantage comparing to other fungi in order to develop a wastewater treatment process.